We’re giving away two pairs of tickets to see Japanese cinematic masterwork An Autumn Afternoon (秋刀魚の味) at Southbank BFI, plus a copy of the new poster for each winner! Read on to learn more about this amazing movie and how to enter for your chance to see it. Now digitally restored, An Autumn Afternoon, the final film by the great Japanese director Yasujiro Ozu is one of his most touching works and, thanks to Yuharu Atsuta’s ravishing camerawork, one of his most beautiful. Perhaps the most personal of Ozu’s treatments of a theme evidently close to his heart, this finds both elderly widower Shuhei Hirayama (the peerless Chishu Ryu) and his daughter Michiko (Shima Iwashita) entertaining decidedly mixed emotions about the prospect of her getting married and leaving her father to fend for himself. To be in with a chance to win of one of two pairs of tickets to see the movie, plus a copy of the new poster, simply leave a comment on this blog telling us your favourite type of movie! Winners can pick a date of their choice at BFI Southbank (subject to availability). Competition closes Monday 26th May. Good luck! Posted in Uncategorized and tagged Cinema, competition. Bookmark the permalink. I love a good drama with an engrossing story but maybe not too sad! There is loss, sadness, the people you know, what you have that you don’t know, every moment of every day in its purity. There is noise, people screaming look at me, explosion after explosion… and there is Ozu. Ozu shows you the tender sadness of what you lose and what you have. There is nothing like Ozu. His art is the observation of everything in a moment that you think doesn’t matter. He makes what you have beautiful. Ozu makes cinema and life better. Ozu loves people and everything ignored by others is significant. It is also heartbreaking. Ozu is life. You live when you see Ozu’s films, you see what is precious, noble and pathetic in everything we have. Just a look from a character at a relative, just a cat crossing an alley, washing on a line or a ship watched by a woman from a bay – life and its passing and the terrible sadness of its vanishing. Ozu is the Shakespeare of the city. Ozu is Ozu. The rest is just rotten candy. Depends on my mood, this evening its a long period drama. Pretty much anything – but for me when it comes to films the general rule of thumb is the cheesier the better! I love this kind of film!! He is an amazing director. Anything quirky, dramatic would be nice. Have to be photogenic too. I love so many genres of film (not Westerns though…) as long as they’re well made with good acting and an engaging story. Would watch anything really. Last movie watched was I wish from Hirozaku Koreeda. Brilliant. I love films that tell a story… that have a reflection on humanity itself and show the viewer a side of themselves they might not have been aware of before. 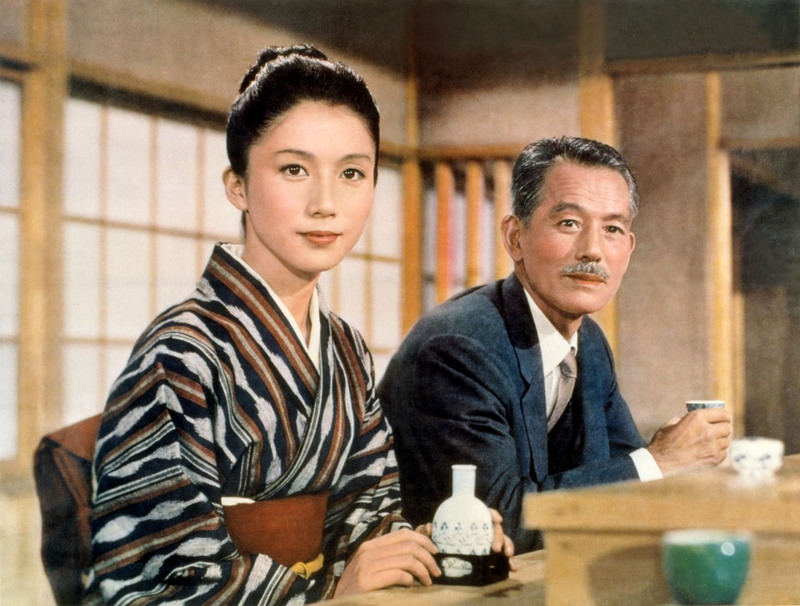 I love Japanese movies for example ‘Yasujiro Ozu’ movies, Tokyo Story, Early Summer and Late Spring. I also love ‘Hayao Miyazaki’, Spirited Away, Castle in the Sky and My Neighbor Totoro. I love mystery movies with elements of comedy. I love dark and gritty dramas centred around problem teenagers, however im also a fan of romance (with a bit of tragedy/drama thrown in there) with a quirky setting or characters. I love fantasy films and some of my favourite films are from Studio Ghibli. With so much positive messages, Ghibli films make me laugh and make cry! My all time favourite is Kiki’s Delivery. I really love watching films I can relate to – fantastical sci-fi or supernatural films are just as fab as slower-paced stuff in my opinion, but unless there are characters I can relate to and who are placed in believable situations for their world, it’s probably not going to grip me quite as much. Usually this ends up with me craving films like Departures, Lost in Translation, My Neighbour Totoro and stuff like that. I don’t have a favourite type of film. However, Ozu has become one of the directors most important to me since I started watching his films in chronological order a few years ago. I have not yet watched his final 2 films, and seeing An Autumn Afternoon at the cinema would be the perfect way to finish viewing his (available) career. Also, I have no money. My favourite type of movies are those that hit you with more scenes sans dialogue. The more I get ‘image-only’ the better. Words are fluffy and frankly not as awesome as a good few shots of wordless happenings. What a fantastic film and prize to win! I am a big Anime fan, we have named our first son Akira, he’s only 8 weeks old and already a handful! I love movies about slightly strange but great people. Anything with a good story and inspired actors. My favorite films tend to be ones with sweeping vistas of beautiful scenery such as Dr. Zhivago. ~ I generally love all kind i of movies l, be it romance, drama, martial art or comedy. I enjoy watching tearjerkers as well, 1 litre iof tears really ddid the trick. I like films that articulate the dynamics of human relationships. Ozu’s films are wonderful and I especially like Mizoguchi’s work too. I love psychological thriller movies such as The Others, Shining… And some Japanese horror movies. I love films which involve sumptuous food such as “Eat Drink Man Woman” and “Jiro Dreams of Sushi”! Of all the great filmmakers — Mizoguchi, Renoir, Tarkovsky, Hitchcock, Tati, and many others — it is Ozu whose films I never tire of. I have seen Tokyo Story more than twenty times and Good Morning almost as many, but would happily watch them again tomorrow. His films are a perfect example of great art made within the forms of popular cinema: in touch with his audience and yet at the same time meticulously crafted and made according to the demands of his own exacting style. They are movies that abolish the false distinctions between high and low art: they are moving, funny and truthful, intelligent but not self-consciously intellectual, playful and never pretentious. What better type of film could there be? Thank you to everyone who entered! This competition is now closed, we’ll be contacting the winners shortly.